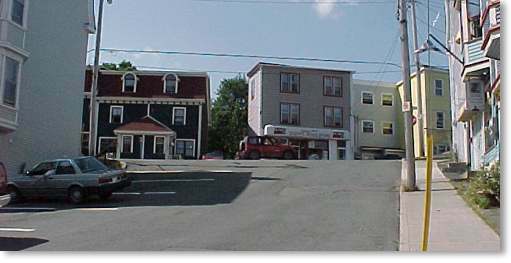 There were no morgues in St. John's during the 19th century. In the 1840s, the Government paid a standing salary to Nancy, who kindly and skillfully cared for the unidentified dead, preparing their bodies for burial. 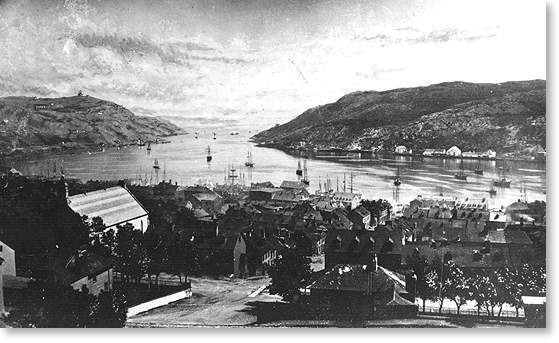 During those days rum was a penny a glass, wharves were well greased with seal fat and cod oil, and the harbour was filled with foreign vessels. View from the Basilica of St. John the Baptist looking towards the Narrows. Courtesy of Archives and Special Collections (Geography Collection 137, Photo 2069), Queen Elizabeth II Library, Memorial University of Newfoundland, St. John's, NL. Many unidentified bodies were found in the harbour. Nancy was said to have "brought many a corpse back to life in her time." One Dutch sailor was being nailed up in his coffin at Nancy's when he suddenly revived. After a drink or two of rum, he was his own man again. Nancy's house also served as a refuge for locked out tradesmen who boarded above their merchants' shops. A light in her window let them know they could get shelter for the night at her house.